Abstract Expressionism as a style resumes the trend of rejecting representation in the art. In 20th century this trend manifested in biomorphic (organic) abstractions of Kandinsky and Surrealists, and in geometric (elementary) abstractions of Malevich and Constructivists. Abstract Expressionism completely rejects all forms (biomorphic as well as geometric) and uses color as the only tool for expression. Two different modes of applying color divide Abstract Expressionism into two sub-styles. The first one is Action Painting and it’s based on a surrealist technique of automatic painting and on ideas of Freudian Psychoanalysis. Within this sub-style, the artist is trying to splash out his individual Unconscious, without applying structures of Conscious or censorship of Superconscious. He fulfills this intention by literally splashing out paint on canvas in expressive gestures (the other name of this sub-style is Gestural Painting). Thus, the painting becomes a spontaneous expression of the Unconscious - visualized in chaotic forms not organized by logical thinking. Iconic artist of Action Painting was Jackson Pollock. He removed the canvas from the stretcher, put it on the floor and covered it with chaotic splashes and drips of paint (this technique is called dripping). Pollock circled around the canvas for many hours; since the process of painting was often public, spectators compared this obsessive motion to ritual actions of a shaman. As a result, the canvass was covered by intercrossing layers of paint. It contributed to the painting a kind of a physical depth which was drastically different from an imaginary depth, created in realistic paintings by means of optical properties of the color and the line (a perspective). 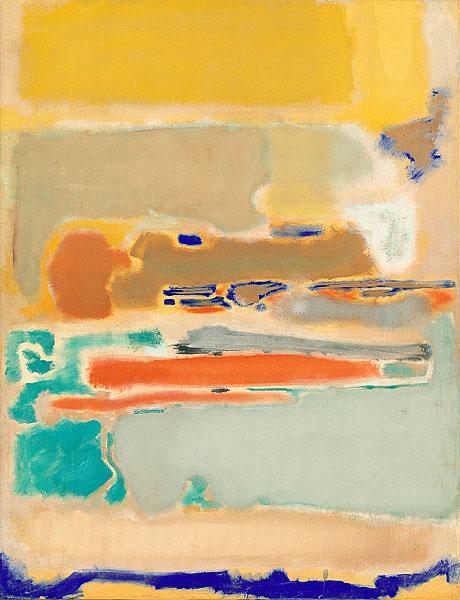 The second sub-style of Abstract Expressionism is Color Field Painting. Here, the artist rejects any form by applying large homogeneous arrays of color, quietly flowing one into another. This sub-style is associated with a Jungian Psychoanalysis and its concept of a collective Unconscious. Each color, or formless combination of color spots, expresses emotions and sentiments originated from certain archetype (an innate psychic structure that comes out in dreams or myths). A representative example of this sub-style is Mark Rothko. He filled huge canvasses with flowing color arrays, creating predominantly horizontal compositions, both contrast or almost monochrome. While contemplating these arrays, a spectator was immersed into a semi-meditative state of dissolution in the surrounding space, as if he was transferred into the space of a dream or a myth. Pollock and Rothko are two “poles” of Abstract Expressionism; however, we should keep in mind that this division is fairly nominal, since both sub-styles share many common stylistic features. One of those is using color as an autonomous mode of communication: it establishes a direct connection with deep structures of the psyche, bypassing symbols as mediators of representation. Both sub-styles tend to monumental size of canvasses, which must be viewed from a close distance. By this move Abstract Expressionism establishes a new type of contact between the painting and the spectator. This “intimate” communication is akin to religious ecstasy, when the spectator is "surrounded" by a picture and "dissolves" in it. One more general feature of Abstract Expressionism is paying more attention to the process of painting then to the result of it. Here, the image is always fundamentally unfinished – as in space (when paint splashes come far beyond the canvass, they turn its frame into merely a conditional boundary), and in time (the artist can paint the image endlessly; it can not be “finished” in the traditional sense). Getting inspired by primitive myths and archaic art, Abstract Expressionism brings the concept of chronotope (mythological cyclic infinite time, not separated from space) to the formal level, using it as a paining strategy.